Transform your living room into a warm and inviting space with underfloor heating. Why Underfloor Heating in your Living Room? Living rooms are often the most social of spaces in your home; they’re where you entertain and spend time with friends and family. Installing an underfloor heating system in your lounge enhances the comfort and cosiness of the room, making it a place where you can truly relax. Underfloor heating is an energy-efficient, cost effective solution to your living room’s heating needs. Alongside the bedroom, living rooms are typically the room in your home where you spend the most time; after a long day at work it’s the space where we relax and renew ourselves. 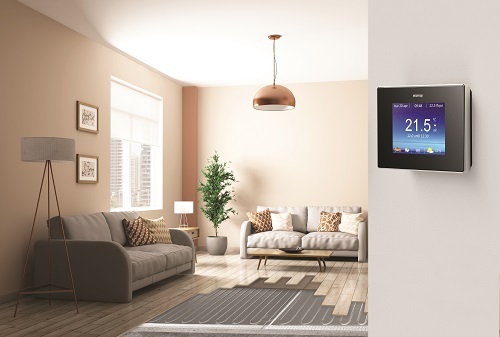 With Warmup underfloor heating and heating controllers, your lounge is gently warmed to your ideal comfort temperature in time for your arrival home. 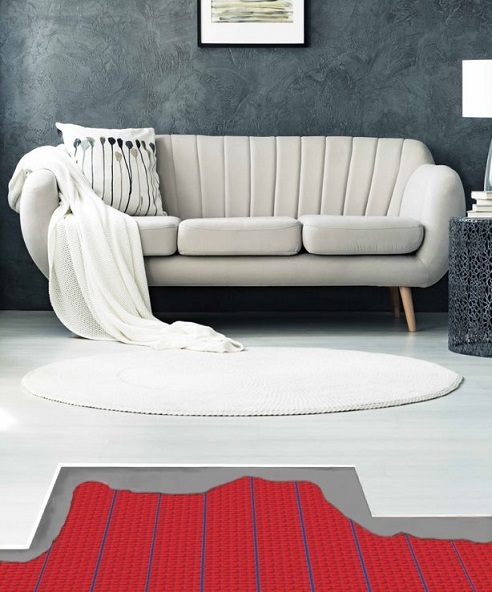 The radiant heat produced by a floor heater also improves the air quality of your lounge by reducing dust circulation compared to traditional radiators. Floor heaters offer a discreet approach to home heating by taking up no wall space. If you’re in the process of renovating your lounge or indeed building your dream home from the ground up, underfloor heating means you don’t have to make any compromises in your interior design plans. You no longer have to place your furniture around fixed radiators; floor heating provides greater design freedom. Warmup provides a wide range of both electric and water underfloor heating systems. Water systems are typically recommended for new-build projects while electric systems are perfect for living room renovations. The DCM-PRO Decoupling Mat System is a favourite with installers around the world due to its rapid installation times and ease of use. It features an anti-fracture mat that prevents possible damage to living rooms with tiled floors. The Foil Heater is perfect for living rooms with carpets. Its aluminium mats distribute heat quickly and efficiently for softer floor finishes. The Total-16 System is a low-profile water floor heating system that is suitable for living room renovation projects. >View our electric underfloor heating range. >View our water underfloor heating range. Due to their energy-efficiency, Warmup floor heaters have low running costs, making them the perfect heating solution for your living room. See our Running Costs Calculator to get an idea of how much it would cost to heat your home.